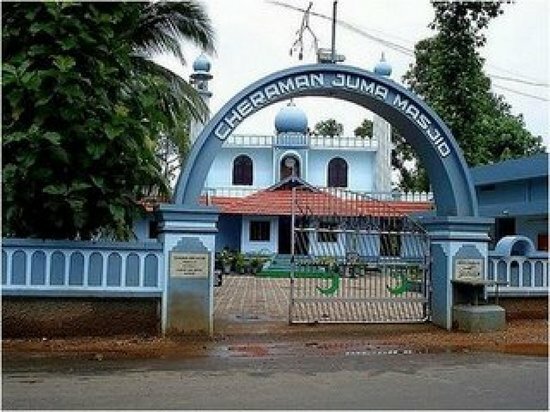 Constructed by Malik Deenar, an Arab and a propagator of Islam is Muslim shrine in Kerala known as Cheraman Juma Masjid. This “Masjid” located in the Thrissur district is considered to be the first mosque ever to have been built in India. It was built in 629 AD by a contemporary of Prophet Muhammad. In addition, this mosque is also supposed to have undergone renovation which involved reconstruction during the 11th century. Furthermore, this mosque is also used by people who are not Muslims particularly to conduct a traditional ceremony that initiates a child into the field of “knowledge acquiring” i.e. learning. If you intend to drive to this mosque then the ideal starting points would be Guruvayur, Thrissur, Ernakulum, and Kochi. There are three routes from Guruvayur to this mosque, and they are via NH66, via Chavakkad Kanjani Road/Chavakkad Kanjany Peringottukara Road/Chavakkad Mullessery Kanjany Road and NH66 and via NH66 and Irinjalakuda Kodungallur Road/Kodungallur Shornur Road. There are three routes from Thrissur to this mosque, and they are via Kodungallur Shornur Road, via NH544 and SH51, and via NH544 and Kodungallur Shornur Road. There are two routes from Ernakulum to this mosque, and they are via NH66 and via NH544 and NH66. There are two routes from Kochi to this mosque, and they are via NH66 and via NH544 and NH66. A popular myth in Kerala states that the “King of Chera” Cheraman Perumal happened to once visit Saudi Arabia and meet with Prophet Muhammad. It was after this meeting that Cheraman decided to convert and thereby embrace Islam renaming himself as Tajuddin. He then resided in Saudi and kept contact via regular letters to his family through a messenger called Malik Ibn Dinar. It was then during the 7th century that Malik Ibn Dinar and Malik bin Habib arrived in the Thrissur district and constructed this mosque/masjid in a town called Kodungallur and named it “Cheraman Perumal”.